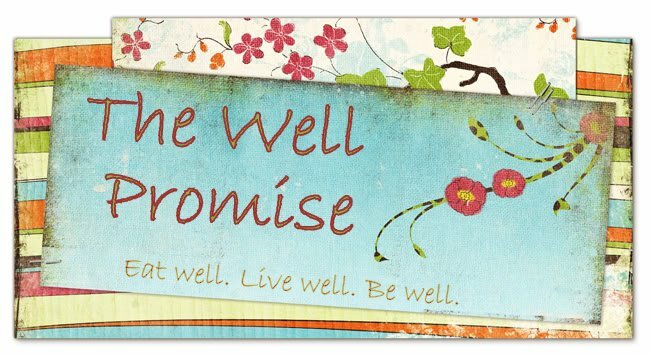 the well promise | eat well. live well. be well. We happen to be going away for the weekend so I really had to use everything in the frig or waste it (again). What better way than to throw it all into a salad? I started with this recipe, but as usual deviated quite a bit. Boil the beats for approximately half an hour, until fork tender. Let cool enough to enable you to peel the outer layer. Then to get a roasty flavor, add them to a skillet or grill for about 5 minutes. Put olive oil in pan and add the minced cloves of garlic. 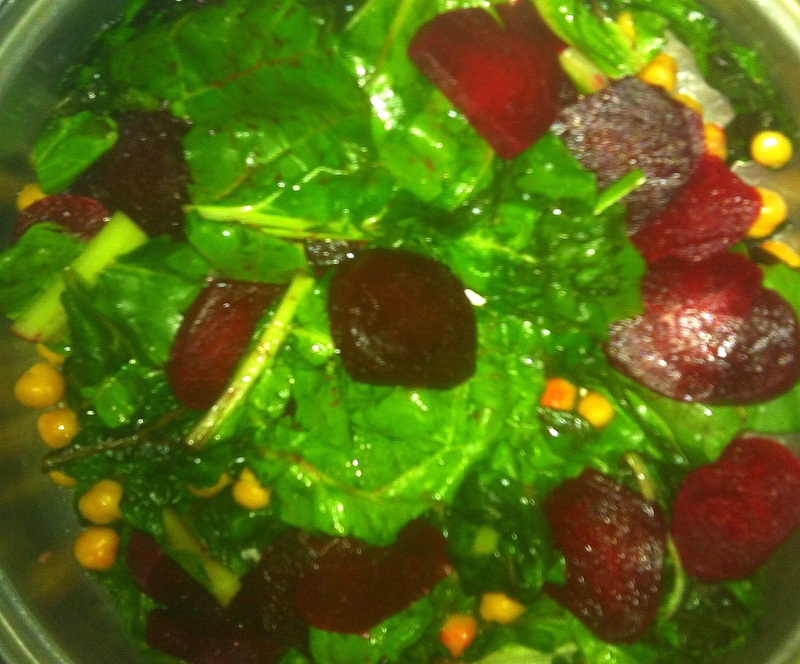 Add the Swiss Chard then cook for 3 to 5 minutes before adding the garbanzo beans. Cook another 3 to 5 minutes, until Swiss Chard is cooked through. Add sliced or chopped beets, then dress with red wine vinegar and sea salt. If you would like, you can top with any kind of cheese. We rarely have goat cheese on hand so I was going to add mozzarella before I realized we were out of that too! I think a nice, fresh Parmesan or feta could also lend a different flavor. This was something very out of the box for us! We’ve made beets a few times before but combining them into a salad (a common thing for many other people) had never really occurred to us. In the fall when we get our own hands dirty picking our own beets we’ll have to remember this recipe! It came out great and was an alternative to romaine or spinach. 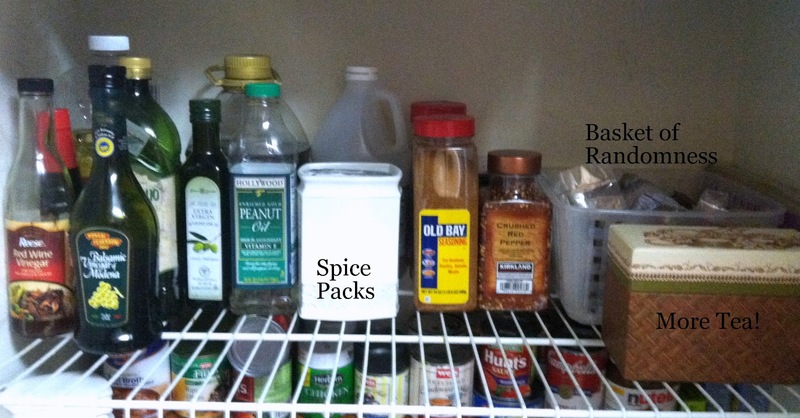 The pantry is a great starting point for organization. If your kitchen is anything like ours, it’s the first place to get out of control. One way to prevent this is by making sure there is a place for everything, even if that means having a basket specifically for items that don’t go anywhere else. I see lots of pantries online that are major investments, but we don’t have the kind of money to spend on fancy containers and baskets. I bought three small plastic baskets for around $1 and some canvas bins that were also $1. Any other containers were things I found around the house: spare wicker baskets, ceramic containers I’ve replaced, an old recipe box. When looking for pantry organization inspiration, the ones on Pinterest were gorgeous but would never work for us – especially as we’re renting and can’t make any permanent changes. 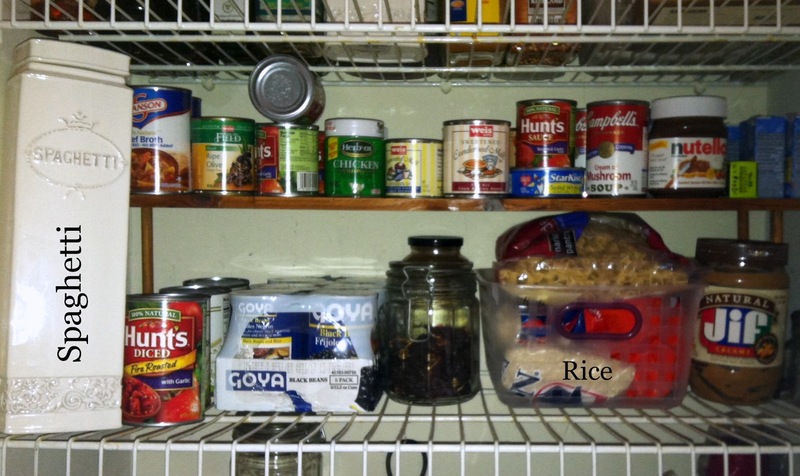 So here’s a guide to my average pantry! 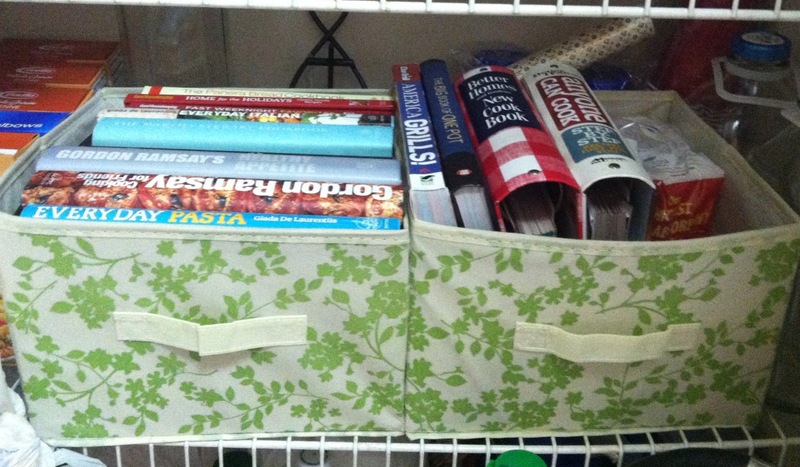 On the bottom shelf I use these canvas bins found at Christmas Tree Shop for holding our cookbooks. I used to keep them on a bookshelf in the living room because there just wasn’t space in the kitchen. Then I got tired of them not being accessible and also not looking so great. The bottom shelf is kind of a mish-mash. It houses all our extra pasta boxes (thanks Cosco!) and glass milk bottles to return to the farmers market for a deposit refund. Now let’s get back to the top. The first shelf is home to a random assortment of goodies. I don’t do too much baking, but I keep a basket of ingredients like cocoa, vanilla extract, and food coloring. I always keep on hand popcorn seeds for a quick, healthy snack. I then keep all the boxes of food in the back because with my new diet they’re for emergencies only. The basket is for daily vitamins, then the glass containers are full of tea. As for the next shelf, I keep yet more tea (flavored tea) in the recipe box. It houses them perfectly and since I don’t print recipes it’s not something I need. Other than that, I keep all my oils and vinegars together on the left and spices in the middle. For all those spice packs I used to have falling through the cracks, I use an old utensil holder. Here, behind the tea, is my basket of randomness. It currently houses sunflower seeds, almonds, and coffee pods (because we drink too much coffee to use the single cup side of our coffee maker). And then I have what is primarily the canned good shelf. I bought this wooden over-the-sink shelf before I realized how impractical it is. Then I realized it fit magically in the pantry to provide another shelf. It cost maybe $5 at Big Lots and it works perfectly. I have a basket specifically for rice and rice noodles then a small jar of Chipotle peppers. Instead of having a thousand boxes of spaghetti, I got this container for it but then realized we don’t use it enough to justify leaving it on the counter. 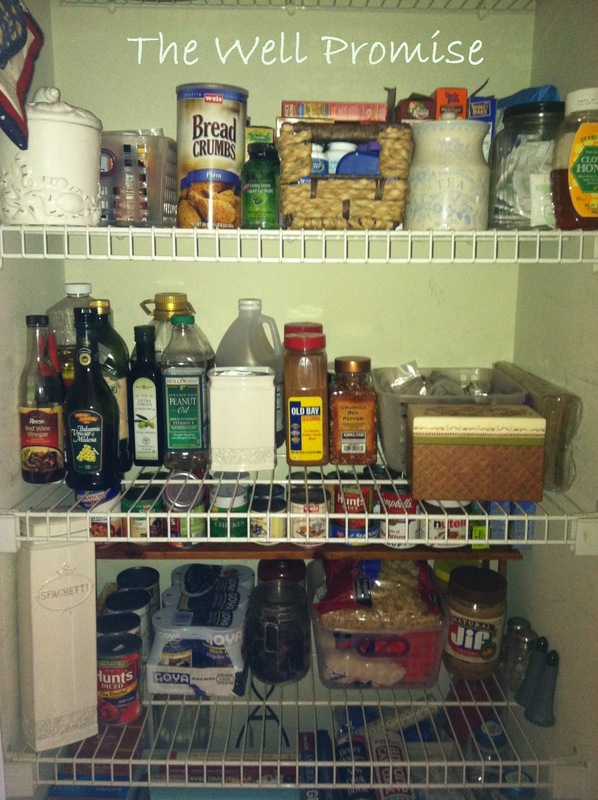 Like I told you, my pantry isn’t pretty and it may not even look organized to the average reader, but it works for us. If you want matching plastic container or cute labeled baskets, then go for it! But a clean, organized kitchen makes it so much easier to get in the habit of cooking and you can see everything you own at one glance. *Sorry for the poor photo quality. My camera broke ages ago and I’ve been using my iPhone ever since! If you’re like me and you’re just getting into running it may be difficult to find a plan that works for you. 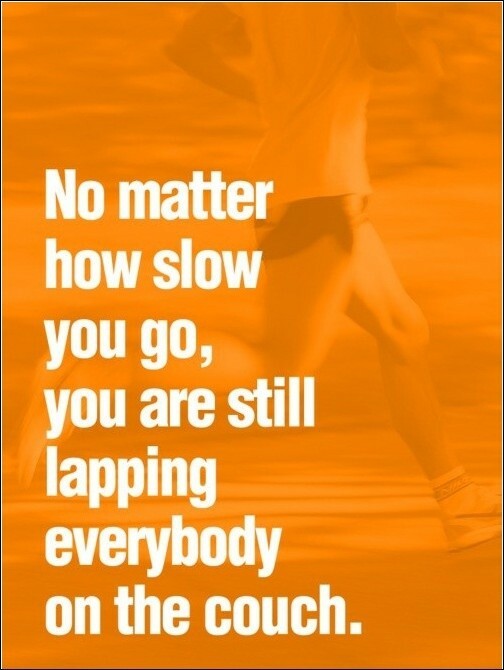 It’s hard to stay motivated when there are plans for people who can “only run two miles” or “only 3 minutes” but not for people whose “chest explodes after 30 seconds”. I’m pretty lazy, hate working out, and love investing energy in excuses. In fact, I was supposed to start running in June but got caught up with life… now I’m way behind on my goal and my boyfriend has already surpassed the 5K mark. We’re planning on running a 5K in the beginning of November, which gives me only 3 months to get to where he is. I did my research and was excited to finally find a running plan for people who are out of shape. Neither I, nor my boyfriend, are experts on running but he definitely has a leg up on experience. He gave me some really great tips when we started running together that helped me relax and enabled me to run further and longer. Most are probably common sense, but not being a runner I was making a lot of mistakes that made running more difficult than it needed to be. Don’t look at your feet. Keep your eyes up and focused on the horizon. Don’t clench your fists. Think about keeping them loose and relaxed. Don’t grit your teeth or tighten your neck. It’ll be sore for the rest of the day. Don’t pound your feet. Run lightly from heel to toe. Don’t hold your breath. Try to keep breathing natural. Drink plenty of water to avoid stitches and burning pain in your chest. 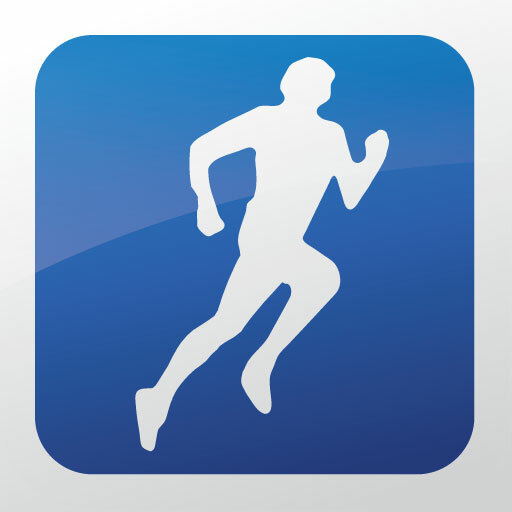 To track your runs, find routes, or even races, RunKeeper.com is a great place to start. I’d honestly be lost without it. It feels good to be able to track your progress, set goals, and receive achievements for milestones (even minor ones). It also has tools to track other activities and track weight loss. It’s amazing how the internet can simplify (but occasionally complicate) getting fit. To see other websites I find helpful, check out my list of links, which are constantly being updated. There are two runs I’m interested in, both this fall. The first is actually 5 miles: The York White Rose Run. It takes place October 20, 2012 and is essentially a tour of York City. If I can finish this one, then the next would be a breeze. The MAG 5K Fall Flash is a run across the Wrightsville Bridge in autumn’s prime: November 3, 2012. So first I need to train for this one, and then I can try to stretch beyond my goal to the 5 miles. This isn’t the healthiest chicken dish I’ve ever made but it turned out great. Leaving the skin on is a major splurge but it really boosts the flavor. Of course this can also be made with boneless, skinless chicken breasts for a healthier alternative. This was given to me as a homemade gift but can also be purchased… or if you’re feeling particularly adventurous you can always make it at home. Prepare your grill. We used charcoal, piling it on one side to take advantage of indirect heat. To prepare your chicken, drizzle some olive oil over the top. Then cover the chicken with your desired amount of seasonings (chili powder, onion salt, and garlic powder). Just as an aside, we probably should have used some paprika. Place the chicken on indirect heat and cover for 20 minutes. Move the chicken closer to the direct heat (or even directly above it) for another 5 minutes. To get a char on the skin, flip the chicken over right about the direct heat for a minute or two. Leaving it too long with result in burnt skin… or even no skin. Flip the breasts over and finish by topping with the jelly (about 1/2 tbsp per breast) and cooking for yet another 5 minutes. We had to turn the chicken about halfway through because the jelly wasn’t caramelizing at an even rate. Done! 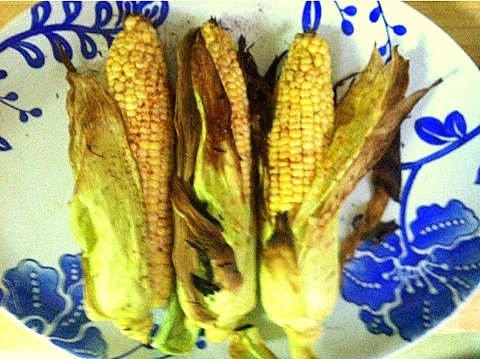 We paired it with this Grilled Corn on the Cob and there was plenty for leftover lunch salads! We fired up the charcoal grill for some delicious corn on the cob, Santa Fe style (or so I like to call it). I spent a good part of my day looking for alternatives to butter… and apparently mayonnaise. I didn’t come up with anything that sounded particularly tasty, so I decided to wing it. We set the charcoal up on one side to provide a low-heat setting. While the grill heated up, I soaked the corn in water – it’s apparently not entirely necessary, but something that’s always worked for me. I then pulled down the husks and yanked off all those pesky hairs. Just apply whatever toppings you want. 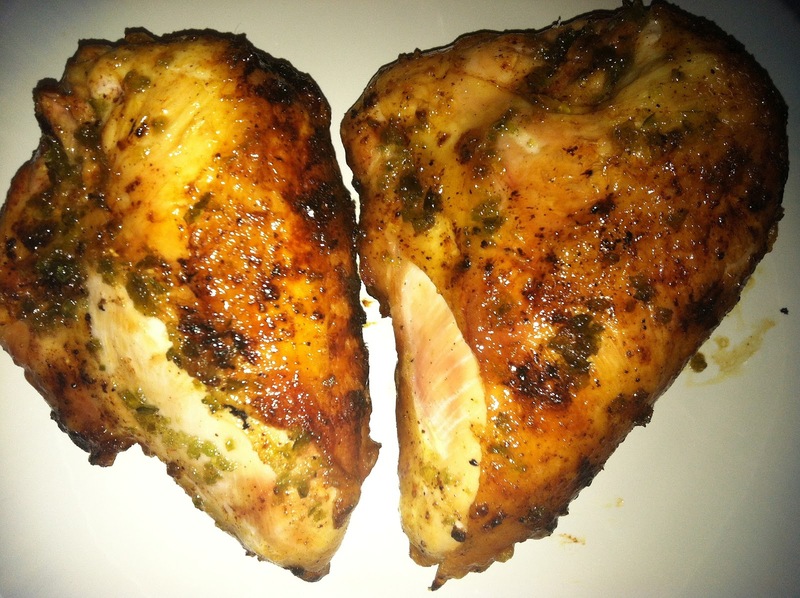 I assume it works with any number of seasonings, but as we were going for something that paired perfectly with Jalapeno-Jelly Chicken Breasts these seasonings worked perfectly. It was completely different, satisfying, and I didn’t miss the butter. Never imagined I’d say that!As for the cooking instructions, just place the corn (husks returned to the original setting) on the low heat side. Ultimately, you want to cook the corn for a total of 15 minutes turning three times. That’s once every five minutes. That’s it! Super easy and gives it a much more complex flavor than simple boiling would. Fair warning: it’s not as sweet and a little more chewy. The crockpot is a great invention. Throw a random assortment of ingredients in your slow cooker in the morning and you have a fully cooked, delicious meal by evening. I often get stuck in a rut, however, with pot roasts and stews and salsa chicken. Luckily, I recently came across a compilation of Low Fat Crockpot Recipes that includes all the nutrition information, along with the Weight Watchers Points. Problem is, it’s Points not Points Plus, but considering all of the recipes are under 10 points I figure it’s safe. I actually own two crockpots, mostly because I couldn’t afford the one I really wanted. I started out with the Hamilton Beach Stay or Go crockpot in a discontinued white. I use it frequently and it’s fairly beat up but it does it’s job well and the latching feature was a major plus. It’s a must if you travel with your crockpot a lot and are tired of fighting rubber bands. The biggest issue with this crockpot is that it does not have a ‘set ‘n forget’ feature. I outgrew this crockpot mostly because when I make stew I insist in overflowing the pot with veggies. I then acquired a Wolfgang Puck 6 qt crockpot that had many different settings and a timer. The timer is, if I may exaggerate, a life-changer. I don’t even have to remember to turn it off. This slowcooker would not travel well. It’s massive and heavy (and impossible to store) but when I’m making enough stew for an army (we like leftovers) or hosting a party it’s my go-to pot that makes everything easier. Because yes, I have overflowed the 4 qt on a couple of occasions. My first experience with Weight Watchers was last summer when I paid for a three month membership. It’s pricey and I couldn’t really afford to keep it up so I purchased a membership package with a plan to do it on my own. The internet makes this option so much more accessible, even for people that never paid for a membership in the first place. There are plenty of resources that provide calculators and Points Plus lists. The hardest part is calculating your allotted points. Since I have a WW approved calculator, I have a way to calculate this and have yet to find a website that matches their number. The great thing about the new plan is that they recognize the need for fruits and veggies and each portion is ZERO points. That leaves you plenty of options for healthy, guilt-free snacks throughout the day. The tracking is tough at first but should soon become second nature. I also created this PointPlus tracker on Excel (which is currently set for my PointsPlus allowance but can be changed). Just utilize Google, start with a ‘Weight Watchers PointsPlus’ search and you’ll have a wealth of resources right at your fingertips! Tons of recipes, points lists, and people ready to share their insight! Amazon also has plenty of options for those looking to start the plan without a membership. You can purchase calculators, books, and entire packages making the plan more portable. It allows for cheats and splurges. It puts the power in your hands, allowing you to make choices and alter the diet to work for you. It can become pricey if you choose to pay for a membership or purchase packages/tools/cookbooks. It’s difficult to get into the habit of tracking what you eat. It encourages you to substitute with less healthy, processed alternatives such as margarine or diet sodas. Constantly having to look up points is difficult at first, when you don’t have an idea of how the system works. I always have trouble with ground beef. I tend to stick to 93% but then I get stuck: there are about four options for where I go from there. Chili, burgers, meatballs, or meatloaf? Usually, I stick to the American standby – hamburgers. And I don’t usually mix it up much, maybe worsterchire or sriracha. Today we had an excess of tomatoes and you probably do too. Maybe not from your garden, but they’re pretty cheap from the farmer’s market right now. We made some salsa. 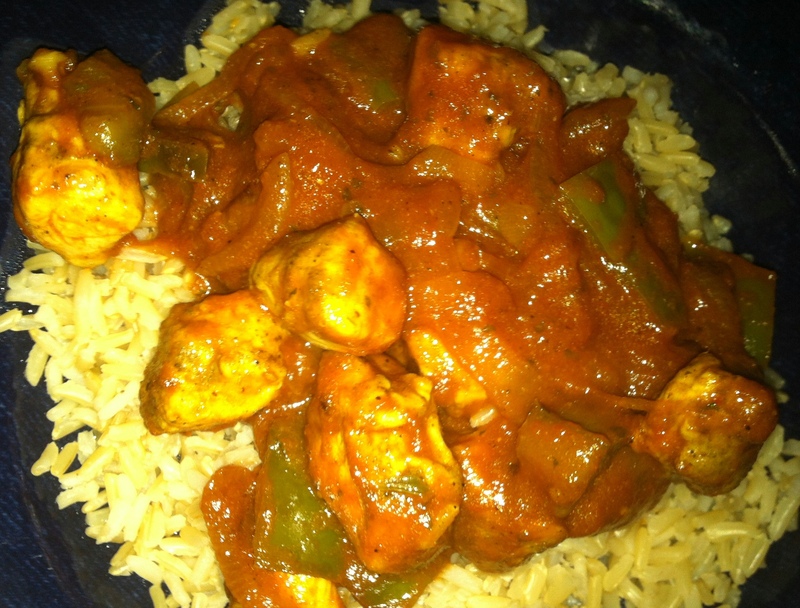 Nothing special, not a recipe… it was pretty good, but nothing to write home about. We didn’t have enough chips leaving us with plenty of leftovers. What to do? Salsa burgers. The main reason I don’t have a picture was that these were just too good. And so easy. Just take some burgers and mix in some salsa! They were restaurant quality with literally no effort. Yum! Plus if you’re following Weight Watchers the salsa adds zero points. We topped it off with some pepper jack cheese and then I ate it with a fork. No added carbs from an oversized bun! There are also a variety of seasonings that can transform your burger, from cajun to curry! Dining Out: Mudhook Brewing Co. I had my first healthy dining out experience Thursday night at Mudhook Brewing Co. I am a huge craft beer fan but usually limit my intake to the weekend. 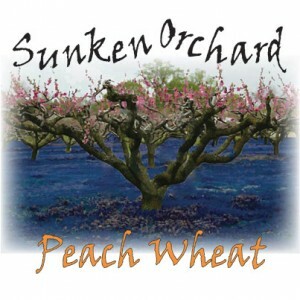 However, they had just released their Sunken Orchard Peach Wheat and I just couldn’t pass up that kind of opportunity. As for my meal, they have some lesser known healthy options. One of my favorites is the Greek Chicken, which is generally placed on a rather thick Kaiser roll. I tell them to skip the role and end up with a delcious entree, then opt for a side of fruit rather than fries. The Thursday night special was a Sicilian burger, however, so I decided to give that a try. It was topped with roasted red peppers and borsin cheese. Rather than fries, it came with pita wedges and olive tapenade. The tapenade was one of the best I’ve ever had and came with just the right amount of pita to avoid a carb overload. I decided to eat the burger as-is: cooked perfectly, juicy, and flavorful. It’s okay to get the burger on a roll (which is really the biggest issue here) if you’re willing to compromise somewhere else: skip the fries, dessert, or eat a salad for lunch. And also take into consideration portion size. Before you even begin eating cut it in half and set one piece to the side. One thing Mudhook could consider doing for people interested in healthier options is a whole grain bread. Generally when dining out be sure to ask your server if there are healthier options. Also, the salad might not be the healthiest option for you and make actually have more calories than some entrees. If dining out is a special treat or you’re at a restaurant you may never have the chance to go to again, don’t worry too much. You don’t want to restrict yourself so much that the experience becomes unenjoyable!